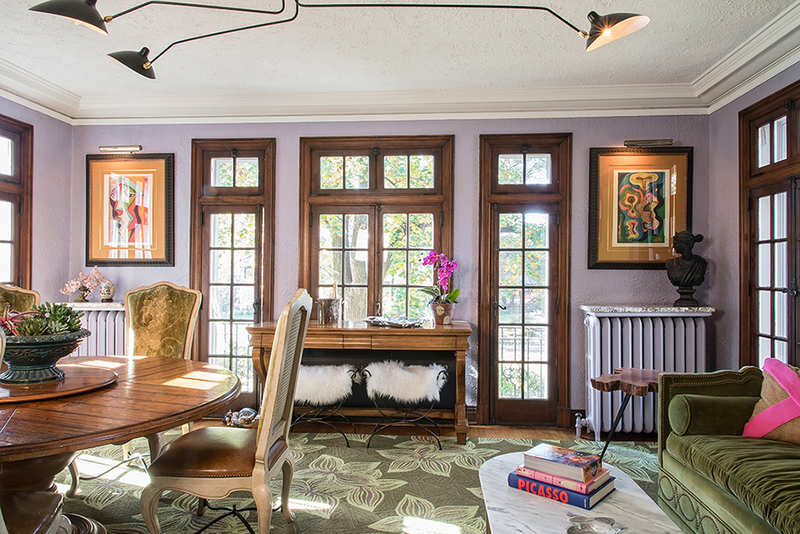 "If you buy what you love, all of a sudden it just work," says homeowner Annie Miller, a local artist and design aficionado who transformed her prominent Italian Renaissance style home with the help of cousin Ron Sauget of Sauget Designs. Miller’s house wasn’t exactly on the market when she and her husband made an offer. The duo heard the University City property was coming soon, and they jumped at an opportunity to buy the residence designed by Thomas P. Barnett, the St. Louis architect famous for the Palace of Liberal Arts for the 1904 World’s Fair, along with a number of important religious buildings, including the Cathedral Basilica. “He did a lot of significant homes and entrances to notable neighborhoods,” Miller adds. Hers, in particular, was commissioned in 1926 by Earl Stanza, a founding member of Oak Grove Cemetery, which explains the sidewalk: a mosaic-looking path made of old granite from tombstones! Structurally, the house was complete when the Millers moved in a few weeks after making their impromptu offer. But, Miller says, the interior “was completely white with hardwood floors.” Her mission, then, was to activate a stunning canvas with an artist’s know-how. “We started with the rugs,” she says. Given the home’s unique angles – “It’s shaped like a boomerang,” explains Miller – Sauget suggested ditching standard rugs for durable, cost-efficient and totally customizable Carpet Art of America commercial rugs. The rugs in the foyer, dining and living rooms were cut for their respective spaces, and they share a nature-inspired color scheme designed to unite three distinct dwellings. In contrast to the leaf pattern in the stately stone foyer, for example, a thick rug – cut around modern curved couches – looks, Miller says, “almost like little pebbles” in the living room. It jives with Benjamin Moore Wedgewood Gray walls, brazenly neutral for accommodating two bright, abstract paintings by local artist Alicia LaChance. 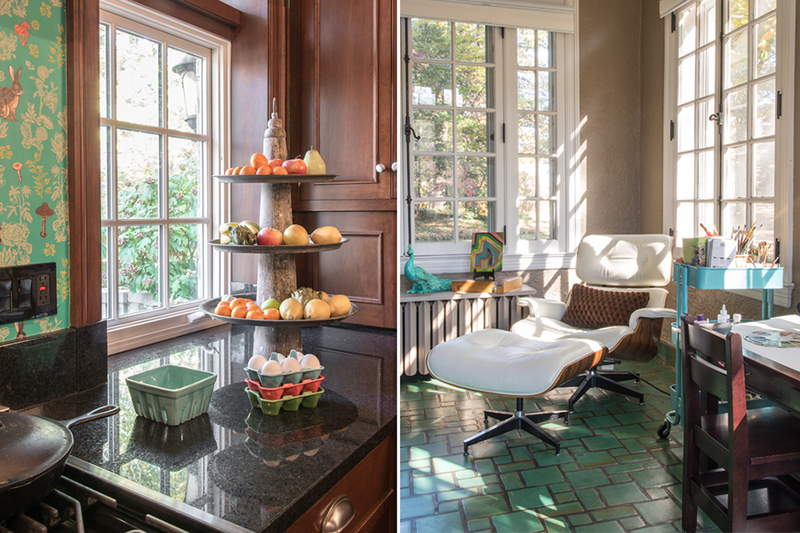 That scheme, adds Miller - “complemented the terracotta floor in the adjoining sunroom.” Miller paints in the sunroom and uses it for a playroom, though, the classic midcentury Eames chair – a killer online find – looks like the perfect spot to cozy up with a book. Miller’s trained eye extends beyond her studio. 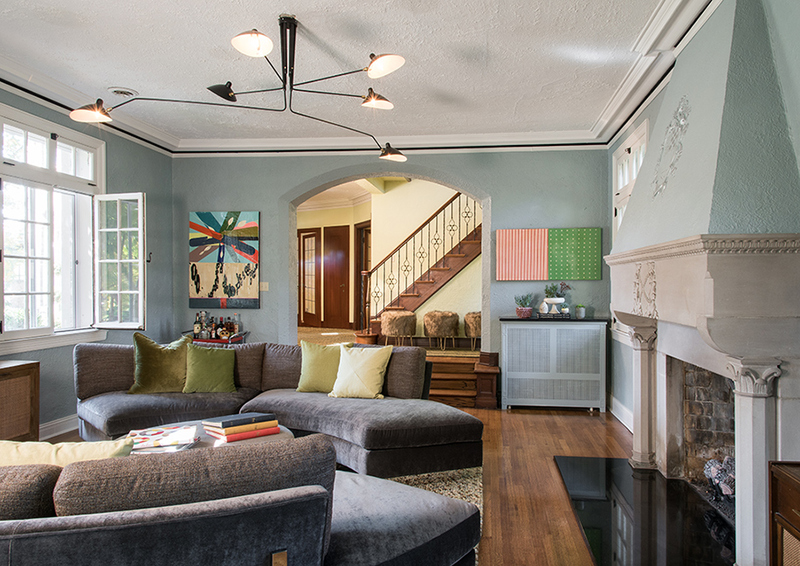 She gave the living room its sophisticated pop by free-styling a black pinstripe along the upper crown molding. Old homes are notoriously dim, and Miller added a mod black fixture, opting for something wide to “put as much light in there as possible,” she says. 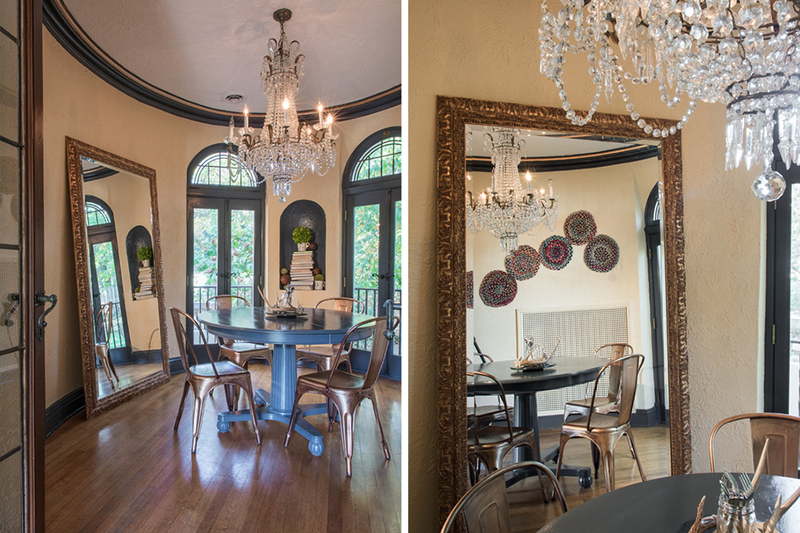 No, you aren’t seeing double: Miller used a smaller version of the fixture in her formal dining room. Actually, scratch the term “dining room.” She turned the concept of formal eating on its head, and created a mixed-use parlor instead. "We started having people over, and everyone was hanging out in [the dining room] because it’s connected to kitchen,” Miller says. She moved her existing dining table and chairs to the side, and incorporated a green sofa and well-appointed buffet to bolster the pre-dinner cocktails and conversation. 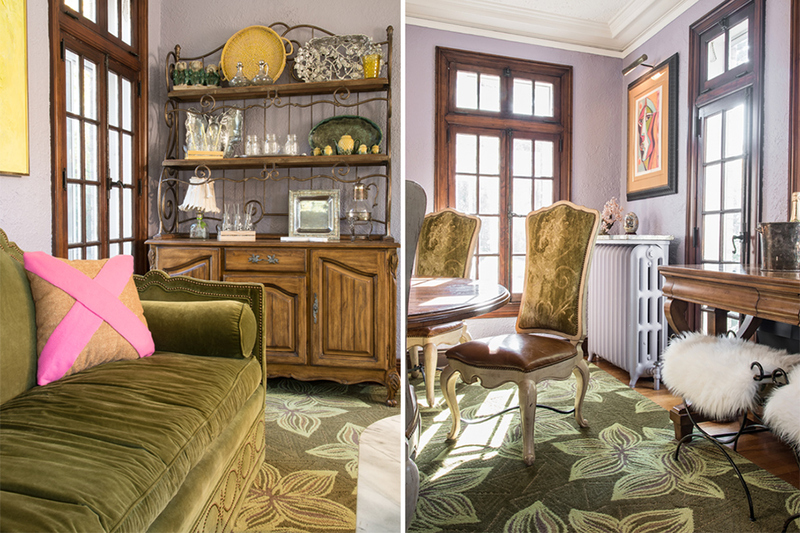 Sauget showed Miller how to make the room feel simultaneously larger and cozier by cutting an oversized floral rug three inches from the cool lavender walls. Miller hung warm artwork, she says, pointing to matching Anthony Quinn pieces and her grandmother’s van Gogh-esque preserved flowers. The wood-and-wallpaper kitchen opens, on its other end, to a breakfast nook made unexpectedly formal with an impactful chandelier – saved from the Millers’ previous home – and classic built-ins. The artist completed this room with wonderfully quirky touches: a milk-painted table; copper chairs and a floor mirror for the illusion of space, along with stacked books and potholders from an art sale. The room, like the entire home, is inspired, but in an unpretentious way, reflecting the homeowner’s humor, good nature and taste.